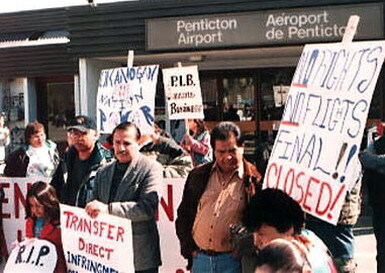 Members of the Penticton Indian Band and Okanagan Nation Alliance blockading Penticton Airport in 1999 to protest expansion plans and assert aboriginal and territorial rights. Chief Stewart Phillip (in centre with the "Transfer" poster) is a long time First Nations activist and President of the Union of BC Indian Chiefs. Copyright: All Rights Reserved. Researched, written, compiled, formatted, hyperlinked and encoded by Dr. Karen Wonders. Images and intellectual property rights reside with the credited owner. Commercial transmission and/or reproduction requires written permission. Use for educational and research purposes requires proper citation.